With EEP, does this mean that SL will be getting a total lighting overhaul? Including Shaders, God Rays, etc. This is a huge disappointment. Right now I just want to give up on Second Life. Are you using an EEP viewer ChinRey? I'm using the latest official realease of the official SL viewer. I haven't checked but I do actally take it for granted that it supports any new feature that has been on a significant number of sims for weeks. The default viewer doesn't have EEP yet. No I don't need it, I'm not an LL bug hunter. But maybe somebody else will show how it's going to look some time in the futures when EEP is officially released? In case they want a direct comparasion to my pictures, the SLURL is http://maps.secondlife.com/secondlife/Coniston/176/19/37, time was 3:03 and 3:04 SLT respectively and my graphics settings was mid plus ALM. Here is another picture btw. This is a morning windlight and I have to say even though it's far from good (it doesn't show on this image but we can still forget about alpha masked plants with day cycles), It's not nearly as bad as the evening. But no matter how it'll end up, there's another huge mistake being made here. I do understand that the disadvantage of having an RC sim is that sometimes new features are luanched prematurely. But when that happens, it should not last for this long. If LL needs more time to test before the official release, do it on a few carefully selected snack servers, not a major RC channel. This is Coniston. It's right in the middle of a fairly large residental area, it has both a Linden Road and a Linden Waterway running through it, and since it's close to two major infohubs and the old Help Islands and Orientation Island, it also has more than its fair share of newcomers who get their first impression of SL here. Who's gonna tell all those people that they they have to switch to a beta viewer and can't use the official viewer release or their preferred TPV? And that's just on Blue Steel sim. There are lots of others and some of them may have even more traffic. Yes, the shaders have been completely redone for EEP. Unfortunately, although planned, crepuscular(God) rays are not going to make the initial release. We encountered a number of performance issues and had to back off. That's good to hear I suppose but I'd really like to ask two questions explained in my latest posts here. The big problem with the current default windlight day cycle is that morning and (especially) evening settings are very hard. Surfaces facing the sun are heavily illuminated with details being washed out, everything else is in deep shadow, and the contrast between the two tends to be very hard and sharp. In other words, there is way too much sun and not nearly enough ambient light. The exaggerated sungliht can be fixed with a bit of grayscale of course but as far as I can see, there's not much to do about the too deep shadows. There's a limit to how high you can set the gamma value before it gets too misty and what we really need, is an easy way to adjust the overall ambient light level. More to the point, no matter what can be done, on mainland we are stuck with whatever LL has chosen. Will EEP fix this? Right now, with a non-EEP viewer, the windlight day cycle on a mainland Blue Steel sim is even worse than it used to be. Are you going to keep it that way until EEP is officially released? And if you are, how long will it take? I had my home on a Le Tigre sim when they first launched SSB. That was a surreal experience but back then LL had the sense to withdraw the project and fix it before they relaunched it. I do not expect any answers to my question since it's not the kind LL usually answers but maybe, just maybe, they read them and take notice? More to the point, no matter what can be done, on mainland we are stuck with whatever LL has chosen. Will EEP fix this? 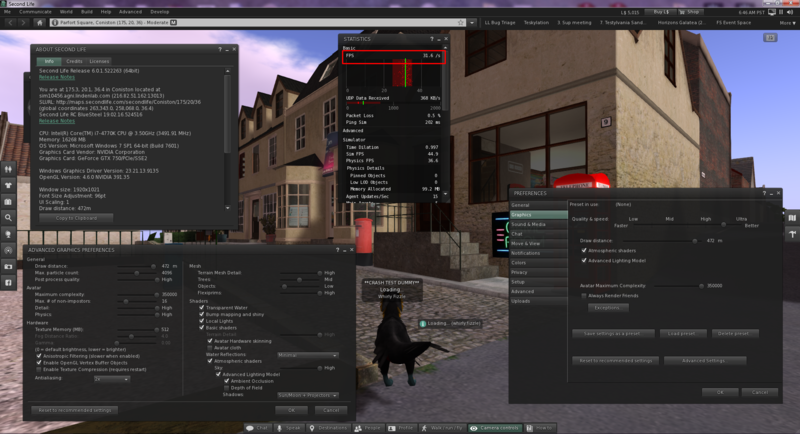 With EEP you can set any parcel you own (or have the correct group roles on a group owned parcel) to have it's own Windlight (fixed sky or daycycle, water) that all EEP enabled viewers will see by default. This will also work for every mainland parcel - as long as it is at least 128 m2 in size. (Not sure how many more times I'm going to have to say this lol). So Does that mean they will be released, once you are able to Iron out all the problems.? Any testing you do with a non-EEP viewer is only testing the temporary attempts to convert the new EEP settings to some approximation of them for non-EEP viewers. These are not perfect and are not really meant to be. Once EEP is promoted to the default viewer we expect that it will be quickly adopted by all actively maintained Third Party Viewers, and we'll all once again be in sync. The only way to see what things will look like with EEP is to use an EEP viewer on an EEP region; the project has made major changes on both the server and viewer side, and we can't make the non-EEP viewers show the same results that an EEP viewer would. Making assertions about how it looks or behaves based on testing with anything other combination is meaningless. If you don't want to test, that's fine (Project viewers are always opt-in), but please don't confuse others by doing invalid tests and making assertions based on them. 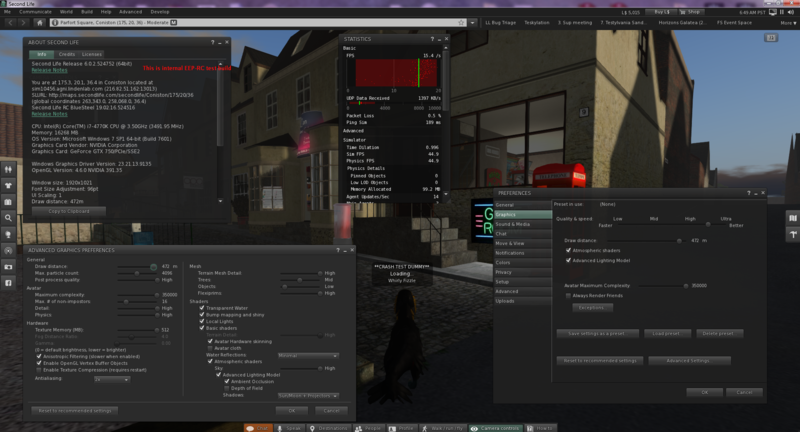 With EEP will a parcel owner be able to have a "sunset view" even if their parcel is on the northern side of the sim? Invalid being, EEP viewer on non-EEP region, or non-EEP viewer on EEP region? Testing needs to be done with EEP viewers on EEP regions. Using a combination of EEP with Non-EEP (viewer or region on either end) is transitory and will become less and less common until the combination finally disappears. Ok, Whirly explained that to me but thank you for the confirmation. Once EEP is promoted to the default viewer we expect that it will be quickly adopted by all actively maintained Third Party Viewers, and we'll all once again be in sync. In the meantime windight in all Blue Steel and Le Tigre regions are essentially broken for everybody who don't use the beta viewer. Is that really necessary? Do you really need something as drastic as that for testing? If not, why not take it down for now and relaunch it when everything is ready? If you don't want to test, that's fine (Project viewers are always opt-in), but please don't confuse others by doing invalid tests and making assertions based on them. I may actually try it after all. I've got my right arm in a sling at the moment so looking is pretty much the only thing I can do in SL the next few days anyway. In order to allow for meaningful testing, yes we do. Everything is very very close to ready, so we're in the home stretch. Ok. I tried the beta viewer and yes, it does look better, Afternoon shadows are still very harsh but not anything as bad as the current default. But WOW does it hit the fps! 30-40% reduction in the same scene with the same graphics settings!!! I really hope you can do something about that before you relase it officially. It's all part of a cunning conspiracy to get bought out by Cyan Worlds. There was this EEP bug about poor performance filed, but it's tagged with Mac. I'll add a comment to that JIRA saying it affects Windows too.